Thanks to MACSI (Mathematics Applications Consortium for Science and Industry), in particular Dr. William Lee and his students of University of Limerick for carrying out analysis and modelling of the PTO. May 2014. Seapower and Limerick Wave entered a partnership to share knowledge & expertise. The Limerick Wave PTO unit will be developed in conjunction with the Seapower Platform. This will advance the direct drive power take off option for the Seapower device. 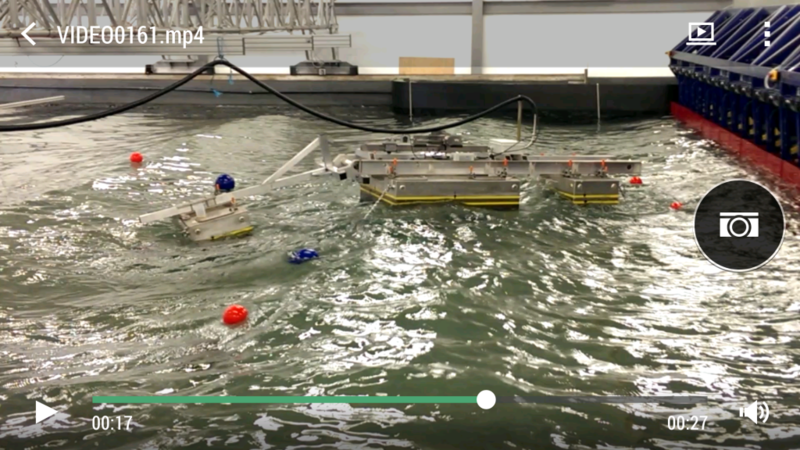 Enterprise Ireland has awarded innovation vouchers to MACSI in the University of Limerick to develop mathematical models of both the Limerick Wave PTO module and Seapower WEC combined into a single Matlab model. A shape optimisation study just completed in February 2014 indicates that the Power Curve can be increased by changing the pontoon and hinge configurations. Seapower will use the Marinet tank testing program to validate these numerical results. Seapower has just complete the assembly of the PTO bench test rig which was grant-aided by the SEAI. November 2011. Sea Power Ltd is finalising a development and validation program on its design concept for a wave energy converter – The Sea Power Platform. Physical and numerical modelling of our test model, along with extensive in-house tank testing and testing in Strathclyde University, have produced significant results. The Power Curve and Power Matrix generated significantly exceed other known devices. The design process for the next Advanced Development Model is underway and work will commence on this in the New Year.